Pentax has announced the availability of its two new compact digital camera – Optio P80 and E80. The new Pentax Optio P80 is the latest model of the popular Optio digital compact series providing a host of advanced features for the capture of brilliant and sharply focused portraits. 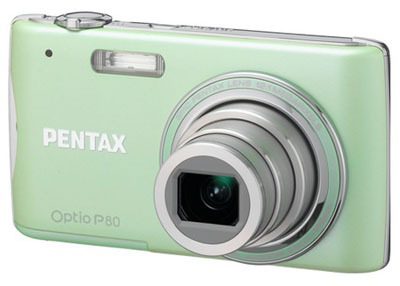 In addition, the new Optio P80 comes with a 2.7-inch LCD display, 12.1 effective megapixels CCD with the Pentax-developed imaging engine and high-performance Pentax zoom lens. Furthermore, the Pentax Optio P80 also equipped with an optical 4X PENTAX wide angle zoom lens with 27.5 wide angles covering focal lengths from 4.9 to 19.6 mm. The P80 camera also integrates anti-shake protection, digital wide mode to capture panoramic shots, frame composite function, PENTAX Shake Reduction (SR) technology, face detection AF and AE function, smile capture, and auto picture mode which has eight different Scene modes for select. This camera is able to record 720p HD video at 30fps and ISO up to 6400. Meanwhile, the new PENTAX Optio E80 comes with a host of user-friendly features and functions to make high-quality digital photography. The new E80 is an entry-level camera with 10 Megapixel CCD, a 3X optical zoom lens (equivalent to 32-96mm focal length), 2.7-inch LCD display with 230k dot resolution, ISO up to 6400, and Face Detection. The camera is capable of recording 720p HD video at 15fps. The new Pentax Optio P80 is available in three fashionable colors including black, pearl, and mint while E80 is available in silver and black color. 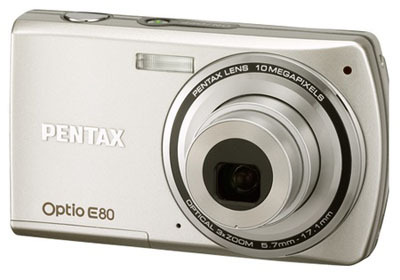 The Pentax Optio P80 and E80 will be available in September 2009 for $199.95 and $129.95 through leading retailer.